During one of the Most Honorable Elijah Muhammad’s Dinner Talks at the Palace in 1974, he began speaking on the subject of Mars, its people and type of civilization. He spoke in such a soft tone that only perhaps a few of us seated near him could hear with clarity. He began speaking about Allah’s promise to allow him to see the people on Mars. In earlier discussions on this subject of Mars, he spoke about the Martian’s ability to hide and conceal themselves underground so that no one would even know that they were there. This immediately brought to mind his earlier discussions about two places on earth where people could hide and conceal themselves for a long period of time without being detected. I further thought that perhaps our entire planetary system, including our own planet earth, contains many hiding places with physical coordinates that connects us from one planet to the other utilizing polar caps which may lead into a subterranean world beneath the surface. These words connect to the subject we are currently discussing about the possibility of a Hollow Earth with a concave entrance through the poles that extends itself into some kind of subterranean world or civilization exhibiting an advanced technology which could include the manufacturing of space craft we identify today as UFOs. These crafts would then be categorized as coming from within our earth rather than from outer planets or galaxies. We are taught by the Most Honorable Elijah Muhammad that the Martian lifespan is 1,200 years. That is certainly most significant since we can hardly reach 100 years living in the present reckless life span. We have also learned that the Martians reach a considerable height of more than seven feet in stature and have communicated with Master W. Fard Muhammad, the Great Mahdi. 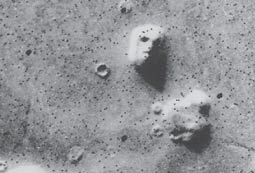 A 1976 Viking 1 photograph of the Face on Mars. There was considerable information that Master Fard Muhammad taught the Most Honorable Elijah Muhammad on this planetary civilization, which includes the fact that Mars, in some remote distant past, served as our Moon. The Hollow Earth theorists speak of this subterranean race or civilization as also being taller in stature and eating mainly a vegetarian diet. There are many comparisons to be made between what we have been taught about the people and civilization on Mars and what has surfaced in published journals on the subject of the Hollow. If this is so, why has this underground world been kept a hidden secret? And why is its entrance, mainly located in the regions of our poles, inclined at 23 and a half degree at both extremities? Why are teams of scientists from several countries organizing expeditions to explore both the Arctic and Antarctic regions of our earth as never before? This exploration is corresponding simultaneously with the exploration of outer space; is there a connection? And why are many of these scientists convinced that there exists an inner world below the earth’s surface corresponding to what we know on its outer surface? Does this inner world defy the laws of physics, or are we illusionaries and children who are raised on bedtime stories or fairytales? Might all planets have a hollow shell interior predisposing it to an empty cavity of space while we revolve in orbits living on its outer surface? In our motion through space, we are constantly bringing up new objects to view which have never been revealed before. What do we really know about advanced civilizations that lived before us and why have we suddenly been put so sound to sleep? The Most Honorable Elijah Muhammad has taught us that beneath the Arabian desert are buried ancient remains of cities and civilizations of unimaginable wealth yet to be discovered. This also leads one to think, what might be buried beneath all the deserts of our planet, and what lie beneath the surface of all the oceans and seas. Let us look at a few Actual Facts given to us to study by Master Fard Muhammad, the Great Mahdi and Founder of the Nation of Islam? First of all, the deserts are 4,861,000 square miles. The resolution of these numbers is 19. The islands are 1,910,000 square miles. The main numbers that stand out are 19 and the number 10, the basis of the mathematical language. The lakes and rivers cover 4,000,000 square miles. The hills and mountains cover 14,000,000 square miles. These are all important numbers to study and to calculate on why we are given these measurements and how to apply them to our daily lives. 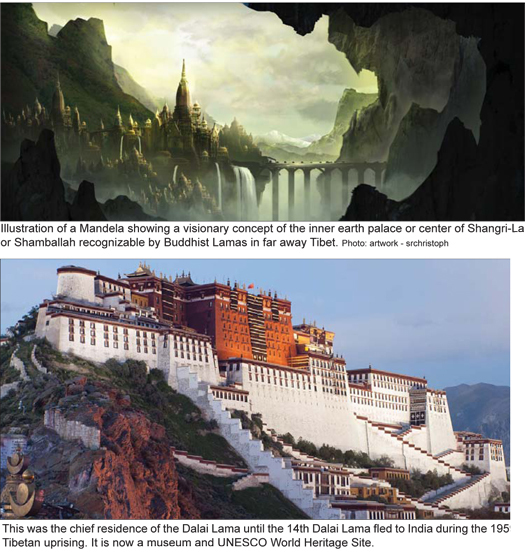 We will note that the deserts, islands, lakes and rivers, hills and mountains, along with all of our oceans are all clearly defined hiding places and can all connect through pathways to the inner earth’s caverns, tunnels, and caves and underground labyrinths, all sources of light transformed into matter and thus leading to worlds of Infinity.